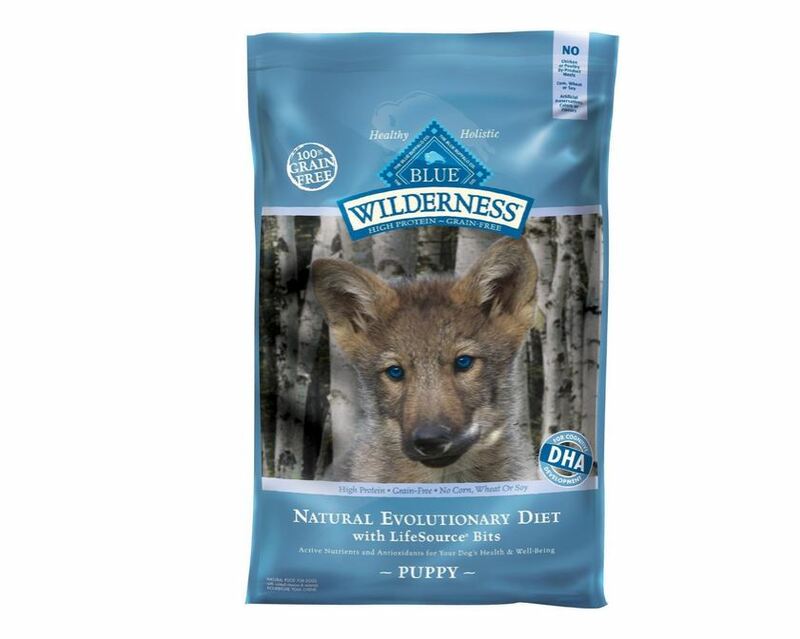 If you feel passionately about raising your puppy on a grain and gluten free diet, then Blue's WIlderness brand of puppy food is a great choice. Along with quality meat or chicken, vegetables and proteins, this brand of dog food also contains Life Source Bits, a special blend of nutrients for your puppy's health. The age and weight feeding guide on the back of the package can be a bit confusing. Is it giving recommendations for the projected weight that your dog will be in the future, or the weight that they are at right now? Being that it is very unlikely that a puppy will weigh 46 lbs at 1-3 months of age ( this is on the feeding age/weight guide on the back of the package) it is hard to tell. I do have to note that even the Blue WIlderness rep that was helping me was confused by the age/weight guide on the back of the bag. Seeing as how my puppies are now the picture of health, not only by my standards , but by the standards of our veterinarian, who says we're doing something right, I am Blue Wilderness' biggest fan right now. I’ll admit it, I don’t know much about pets, more specifically dogs. But I think one of the luckiest things that could have happened to me and my 2 new puppies was to run into a representative from the pet food company Blue a couple of months ago at my local pet store. My youngest child had been begging for a dog for about half a year. He would play with every dog that came within a reasonable distance of him, and look up at me with puppy dog eyes of his own (pun intended). He knew exactly what he was doing with those looks, melting his poor mama’s heart. About a week before Christmas, off he went with my hubby to take a look at some puppies at a local rescue shelter and shortly after that, I received the call: They were coming home with not one but two puppies. Yes, two. I scrambled to get a few things for the puppies. Luckily, my next door neighbor had a dog crate that we could borrow. But we didn’t have any dog food, or snacks, or anything at all, really. So I trekked over to my local pet food store where I stood in the middle of an endless row of dog food, totally lost. But, like I said, lucky for me, a rep from the Dog food brand Blue Wilderness was there to answer my questions. I didn’t know he was a rep for that company but seeing as how he seemed to either work there or be familiar with the dog food aisle, I struck up a chat with him about not knowing which dog food brand to buy. And, of course he was very happy to help me out with that. To be fair, he was up front and told me that he was biased because he worked for Blue, but he kindly took some time to give me some good puppy dog food tips. He first explained that I should start by feeding my puppies puppy food instead of dog food , because it was specially formulated for puppies sensitive digestive system and their growing bodies. He went on to explain how to transition them to adult dog food, based on their weight/age and to slowly incorporate it into their puppy food for the gentlest transition. According to the rep, Blue Wilderness puppy food was all natural, grain free, gluten free and packed with protein and vegetables. It seemed expensive to me, but the rep reassured me that it was actually less expensive than some of the more well known brands like Beneful. So, I decided to give it a try and we have been buying their puppy food ever since. It’s been about 2 months since that trip to the pet store and since then, our puppies seem to literally glow with health. 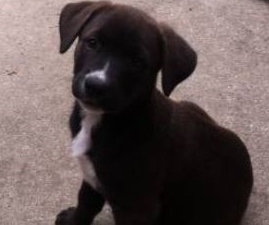 We got two puppies, a lab mix, both from the same litter (brother and sister) and they are like two peas in a pod. They have distinct personalities and are a joy in our lives. They love to be outdoors and lucky for us, they have a half acre to run around in, and boy do they run around. My husband pointed out how their constant running and playful activity has yielded incredible muscle tone in them, and I have to add that I have clearly seen how gorgeous and shiny their coat is. I can’t help but think that this is due to a few things, their physical activity, the love and care that we lavish on them, and of course, their diet. When I went back on the Blue website, to find out a little more about the ingredients in their brand of dog food, not only was I encouraged in regards to the fresh chicken, or meat, veggies and fruit that was included in their puppy food, but I was also surprised to see that, included in their blend of dog food is something they call Life Source Bits. This is basically a blend of antioxidants, vitamins and nutrients to support the immune system of your pet. Being that I am someone who is hugely into supplements for better health, I was over the moon to discover this. And not only that, Blue dog food does not include any corn, wheat or soy, items that I have removed from my own diet, ever since I started following the Fast Metabolism Diet to lower my cholesterol. Being that our puppies are now a part of our family, I certainly don’t want to give them those additives if I can help it and I really want to make sure that I give them the best that I can give them to start out their lives and their health on the right foot. With this blend of a healthy diet and daily exercise, I am excited to see our puppies develop into strong, healthy dogs.